Counters allow you to index data items by a selected increment or decrement value, making the data items to increase or decrease by a specified value each time a label is printed. Counters can be used with TextItem as well as BarcodeItem objects. A counter is set up on a TextItem or BarcodeItem object by using the CounterStep property. The CounterStep property can be set up to any integer number which specifies the increment or decrement step depending on if the interger value is positive or negative. When you enable counter feature on a TextItem or BarcodeItem object, the first integer number found in the Text property (for TextItem objects) or Code property (for BarcodeItem objects) when scanning from right to left starts the indexing portion of the data item. If the alphanumeric field to be indexed ends with an alpha character, the data is scanned, character by character, from right to left until a numeric character is encountered. 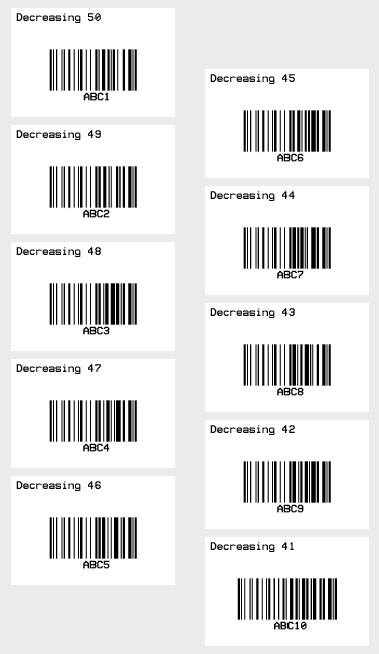 The following sample features a Counter scenario for printing 10 labels with a Barcode Code-128 for values ranging from "ABC1" to "ABC10" and a text decreasing from 50 to 49.